Vedantu.com - No.1 online tutoring company in India provides you the Free PDF download of NCERT Solutions for Class 8 Science (Chemistry) Chapter 6 - Combustion and Flame solved by Expert Teachers as per NCERT (CBSE) Book guidelines. All Chapter 6 - Combustion and Flame Exercise Questions with Solutions to help you to revise complete Syllabus and Score More marks. Register for our free webinar class with best Science tutor in India. Different kinds of fuel are used for various purposes at home, in industry and for running automobiles. Fuels like cowdung, wood, coal, charcoal, petrol, diesel, compressed natural gas (CNG), etc. are known to the students. They are familiar with the burning of a candle. What is the difference between the burning of a candle and the burning of a fuel like coal? Candle burns with a flame whereas coal does not. Similarly, students will find many other materials burning without a flame. In NCERT Grade 8 Science Chapter 6, Combustion and Flame, the chemical process of burning and the types of flame produced during this process are studied in detail. What is Combustion? How Do We Control Fire? Types of Combustion, Flame, Structure of a Flame, What is a Fuel? And Fuel Efficiency are some of the main topics studied in this chapter. Introduction to new concepts, new technical terms, Project work and demonstrations, make this chapter very creative and colourful. Activities and project work help the students to learn beyond the textbook and expand their learning. These also help to invoke the scientific curiosity and excitement in the students. Technical terms, colourful images, examples and illustrations help to understand NCERT Grade 8 Science Chapter 6, Combustion and Flame better and make the learning experience fun and interesting. 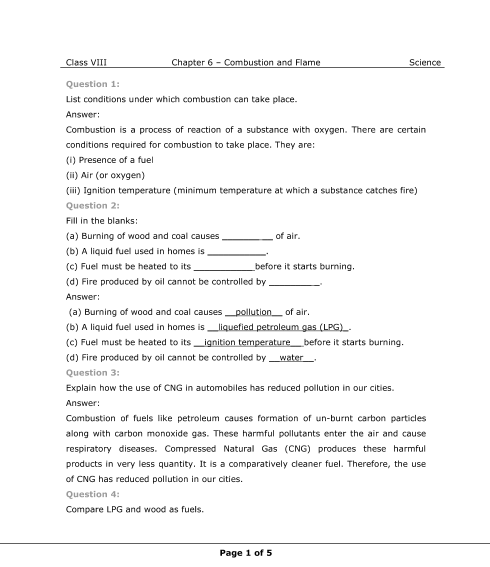 Get 100 percent accurate NCERT Solutions for Class 8 Science Chapter 6 (Combustion and Flame) explained by expert Science teachers. We provide solutions for the questions given in Class 8 Science textbook as per CBSE Board guidelines from the latest NCERT book for Class 8 Science. The topics and sub-topics in Chapter 6 Combustion and Flame are given below. Ex 6.2 - How Do We Control Fire? Ex 6.6 - What is a Fuel? Ex 6.7 - Fuel Efficiency? Chapter 6 - 13 Questions with Solutions. Other than given exercises, you should also practice all the solved examples given in the book to clear your concepts on Combustion and Flame. Download the free PDF of Chapter 6 Combustion and Flame and take the print out to keep it handy for your exam preparation.